Great recipe show godbless you!! Its very very fun watching you. Thanks!!! Really good show , Lucia ! Will be trying many of your recipes especially the baked beans ! Thanks and God bless ! Praise the Lord! Let me know how you like the recipes you try! Enjoyed the recipe show! The recipes looked so easy, and you are such a natural presenter. I have your first recipe book and look forward to the next one and the next show! 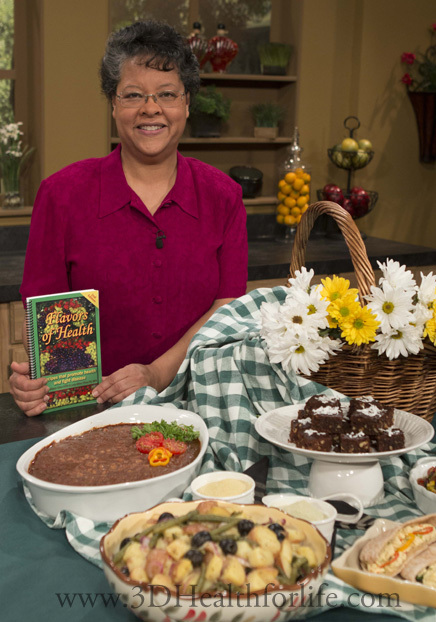 I watched your show tonight(5/13/15), want to try several of recipes demonstrated, especially Texan Black Bean Salad, and the seasonings. I am interested in your cookbook, not sure which one to buy. You mentioned in 5/13/15 that the second edition had some corrections for the first edition. Can you give me an idea how different they are? I am interested in getting the recipes for the seasonings. What is the price of each. Sorry that wasn’t clear in the presentation. The first edition sold out, and if you order a cookbook you will receive the 2nd edition which is available NOW! You can get the seasoning recipes by going here: http://3abn.org/recipes/ and click on my name, Lucia Tiffany. All the recipes from the show are there. To order a cookbook and check prices, go here: http://3dhealthforlife.com/store/#!/c/0/inview=product49722844&offset=0&sort=normal and you can choose either the English or Spanish version of the cookbook. I can say we really enjoyed your demonstration on picnic foods on 3ABN last night. You have a gift in presenting, not only the audio but the foods looked edible as well. Like Jill said “Umm, Umm”. The cook book is on my must have list. Though I have vowed not to buy anymore cook books :). Thankful, I kept watching. Texan Black Bean Salad was delicious and what truly made it a joy was to see my little niece being able to eat it and had if I remember 3 servings. We have to be so careful with her with all the food allergies and when we find something that she can eat we all are happy and this Sabbath past 5/16/15 we all were very happy so yes I will be making this very often. Can you please give me the name of the place you mentioned where you purchase your grade A spices? Sorry I did not get a chance to write it down. Thanks and keep giving us these delicious recipes.. I just caught the very end of the show and was not prepared to write anything down. I really liked the black bean and corn dish and I would like to take one to fellowship lunch this Sabbath. bu I can’t get the book until the first. Hi Cal, Sorry I was out of town right after the program aired and I missed seeing your comment. I’ll email it to you though!